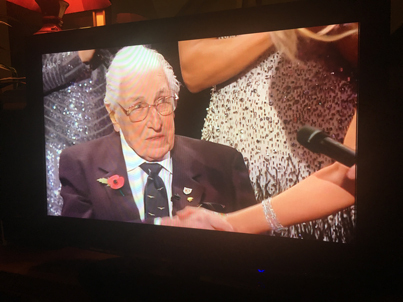 Many congratulations to former Surrey president and cross country team manager Bill Lucas DFC, who was recognised as Britain’s oldest living Olympian in the Daily Mirror Pride of Britain awards on ITV on November 1st. Bill competed in the 5000m at the London Olympics at Wembley in 1948 after just one year's training after serving in the RAF's Bomber Command for seven years and flying 81 missions, surviving unharmed. He was included in the section of the programme to congratulate Britain’s successful Olympic and Paralympic athletes in Rio this summer. He was in remarkably good form considering he’s in his 100th year but he had to be helped on to the stage as he broke a leg when visiting his local library in Cowfold, West Sussex earlier this year, a few weeks after undergoing open heart surgery. He showed he has lost none of his Chutzpah in a lively encounter with presenter Carol Vorderman, who said it was an honour to meet him. Bill responded: “Nice to meet you too.” Carol revealed: “ You’ve got a big birthday in January,” and amid cheers and applause from the audience Bill revealed: “I will be 100 on the 16th.” Bill interjected after Carol told the audience he was a bomber pilot in the second world war: “Hitler deprived me of my best athletic years so what did I do. I went out and bombed him.” amid much laughter from the star-studded audience. Bill’s lifelong club, Belgrave Harriers, are organising a grand birthday party to celebrate his centenary on January 15th in Belgrave Hall. Since this notice was posted Bill and Sheena have been seriously hurt in a road accident and have both been in hospital. On November 19th they were passengers in a Sport Utility Vehicle driven by a 94-year-old World War Two bomber pilot and on their way to a picture signing for bomber command. The driver managed to roll it over at a roundabout in Burgess Hill and while he and another passenger escaped unhurt, both Bill and Sheena had to be cut out of the wreckage by firemen. Bill suffered a broken collarbone and Sheena cracked ribs and breastbone. After being treated in the emergency department at Brighton Hospital they were transferred to Horsham Hospital for recuperation and rehabilitation. I went to see them there on December 18th and, despite their ordeal, they both seemed in good form and were looking forward to the January celebrations. They were in their own two-bed ward. Happily, they were discharged just before the festive season and were able to spend Christmas at their home in Cowfold with neighbours and friends making sure they were able to cope. They were certainly happy to be out of hospital and in their own surroundings. Both sets of injuries are healing but Bill has problems with a swollen right leg which doctors are trying to resolve. 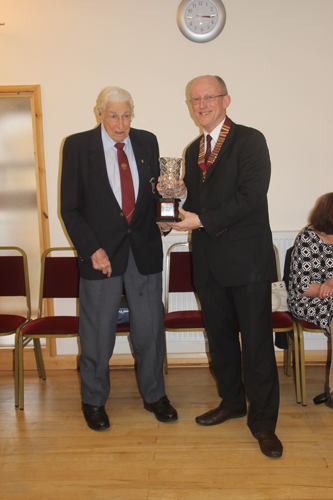 ROY LOMAX - We regret to pass on news of the death of Walton AC president Roy Lomax at the age of 88. Roy died peacefully in his sleep on Tuesday, 6th December. Roy joined Walton AC in 1948 and competed successfully as a middle-distance and cross-country runner. He officiated for many years as a starter and was Walton's President for the last 40 years. He served on the Surrey committee for many years and was a Life Member of the County Association. His funeral will be at 12.30pm on Friday 30th December 2016 at Woking Crematorium, Hermitage Road, Woking GU21 8TJ. Thereafter to Brooklands Museum, Brooklands Road, Weybridge KT13 0QN. BRIAN HARLICK 1942 - 2016 - It is with sadness that we report that Brian died on 14th December 2016. We remember him as an athlete and as a technical oficial. His profile shows that he competed in the Pole Vault in the Main Surrey Championships from 1994 - 2010 having previously competed in the Surrey Cross-Country Championships from 1983 - 1986. Brian’s funeral will take place at 2.20 p.m. on Wednesday 4th January 2017 at Kingston Crematorium. Afterwards all are welcome at The King’s Centre Coppard Gardens, Chessington KT9 2GZ. However, Marianne would like to know numbers for those going to The Kings Centre for catering purposes. Please let Liz Sissons know as soon as possible so that she can let Marianne know. It is the Family’s wish that charitable donations be made instead of flowers. Details will be given on the day of the funeral. SURREY U13/U15 SPORTSHALL, SPECTRUM, GUILDFORD, 22ND JANUARY 2017 - TIMETABLE. EUROPEAN COUNTY CROSS-COUNTRY CHAMPIONSHIPS, CHIA, ITALY, 11TH DECEMBER 2016 - Phoebe Law (Kingston AC & Polytechnic Harriers) finished in 22nd place in the Junior Women's race and was the 5th British runner to finish. The team won the Gold Medal. Surrey teams win medals in all eight age groups. Individual victories for Dominique Corradi (U15G) and Jaden Kennedy (U13B). Other individual medal winners were Felix Vaughan (2nd U13B), Ricky Lutakome (3rd U17M), Niamh Brown (3rd U20W), Claudia Lance Jones (3rd U17W), Olivia McDonald (3rd U15G) and Maisie Collis (3rd U13G). In the Senior Women's race there were also medals for Under-23 athletes where Steph McCall was 1st and Katie Bingle was 2nd. The winning Under-15 Girls team. SURREY U13/U15 SPORTSHALL, SPECTRUM, GUILDFORD, 27TH NOVEMBER 2016 - RESULTS. SURREY COUNTY TRACK & FIELD RANKINGS 2016 - The County Statisticians have completed their work on the County lists for 2016. These results have been added to the Annual Analysis which now covers the years 2003 - 2016 for Under-13s, Under-15s and Under-17s. This gives some indication of the improving standard of Surrey athletes in many events. It is also possible to see where our weaknesses are. Annual Statistical Analysis of U13 / U15 / U17 Track & Field Performances. We are still seeking to increase our team of statisticians (currently 2) to spread the workload. If you would like further details then please contact the Webmaster. TWO AFD ATHLETES FATALLY HIT BY A CAR WHILST ON AN EVENING TRAINING RUN. - Our condolences go to the families of Stacey Burrows and Lucy Pygott and our friends at Aldershot, Farnham & District AC following the incident on Tuesday, 8th November. Further details. COURSES FOR OFFICIALS BEING HELD IN SURREY - SCAA is promoting courses in all disciplines during this month: on 26th November 2016 (Field/Track/Timekeeping/Photo Finish) at Wimbledon College and on 30th November 2016 (Starting) at Kingsmeadow. Further details. SELECTION CRITERIA FOR SURREY COUNTY CROSS-COUNTRY TEAMS - Click on "Team Selection" in left-hand column for 2016-17 criteria. RESULTS (41k Excel xlsx). Performances added to results database and athlete profiles updated. NB. U13G Results corrected on 04.11.2016. Revised Results:- M40/M50 Women & M60. Performances added to results database and athlete profiles updated. DAVID COCKSEDGE - It is with deep regret that we learn of the death of David Cocksedge whilst visting Thailand where he had previously lived for several years. He was a Surrey County statistician for many years and also edited SCAN. He was also a regular contributor to Athletics Weekly with particular emphasis on articles about promising young athletes. We will provide further information when we receive it. SURREY U13/U15 SPORTSHALL, SPECTRUM, GUILDFORD, 16TH OCTOBER 2016 - Results. SURREY COUNTY CROSS-COUNTRY TEAMS FOR INTER-COUNTY FIXTURES 2016/2017 - Selection Criteria is available. Congratulations to Pippa Earley (Kingston & Polytechnic) on her 2nd place in the Intermediate Girls Heptathlon with a score of 4845 points. Toby Gold (Kingston & Poly) - T33 100m Silver. Georgina Hermitage (Guildford & Godalming) - T37 100m Gold & T37 400m Gold. OLYMPIC GAMES, BEIJING, CHINA 2008 - Following the re-analyis of doping control samples for Denis Alexeev the IOC has announced the disqualification of the Russian Men's 4x400m Relay team. This elevates the GB & NI team to third place. Therefore Martin Rooney should receive a bronze medal as he ran the fourth leg. SURREY COUNTY CHAMPIONSHIPS, 10TH/11TH SEPTEMBER 2016 - RESULTS (Both days) (56k xlsx). Series data for field events added 30 September. SURREY COUNTY ROAD RELAYS, WIMBLEDON, 3RD SEPTEMBER 2016 - RESULTS. Performances have been added to athlete profiles where applicable. EA U15/U17 TRACK & FIELD CHAMPIONSHIPS, BEDFORD, 27TH/28TH AUGUST 2016 - Congratulations to Kyle Reynolds-Warmington (Belgrave) on his double victories in the U15 Boys 100m/200m and to the other Surrey winners Katy-Ann McDonald (Blackheath & Bromley) in the U17 Women 800m; Marcia Sey (Croydon) in the U15 Girls 75m Hurdles and Ore Adamson (Herne Hill) in the U15G Long Jump. SURREY MEDAL WINNERS. SURREY 10,000M TRACK CHAMPIONSHIP, TOOTING BEC, 27TH AUGUST 2016 - RESULTS (revised 26/09/2016). Competitors assemble for the Surrey 10,000 metres track Championship at Tooting Bec at midday on 27th August, 2016. After a torrid 25-lap battle, Matthew Sharp (HW) took back the title he won in 2014, which was exactly 40 years after his father Maurice won on the (then) cinder track at Wimbledon Park. SEAA U15 & U20 INTER-COUNTY TRACK & FIELD CHAMPIONSHIPS, HORSPATH, 21ST AUGUST 2016 - RESULTS. EA U15/U17 COMBINED EVENTS CHAMPIONSHIPS, BEDFORD, 20TH/21ST AUGUST 2016 - Congratulations to Alexa Eichelmann (Woking AC) on her third place in the Under-17 Women's Heptathlon with a score of 4576pts. SURREY MEDAL WINNERS. SURREY COUNTY 5K ROAD CHAMPIONSHIPS, WIMBLEDON, 14TH AUGUST 2016 - RESULTS. SURREY ROAD LEAGUE 2016 - Results & League Tables after the seventh and final race. SURREY UNDER-13 BOY'S 800M BEST PERFORMANCE - Jaden Kennedy (Herne Hill H) recorded a time of 2:06.35 at the Woking AC Open Meeting held at Woking on 10th August 2016. This was an improvement on the previous best of 2:09.00 whic he set in July. Surrey All-time Best Performers for Under-13 Boys 800m. James Dasaolu (100m & 4x100m - Croydon H); Martyn Rooney (400M & 4x400m - Croydon H); Harry Aikines-Aryeetey (4x100m - Sutton & District AC); Morgan Lake (High Jump - Windsor, Slough, Eton & Hounslow AC) and Jade Lally (Discus - Shaftesbury Barnet H). Friday, 12th August: Men's 400m Heats - Martyn Rooney 5th Heat 4 45.60. Saturday, 13th August: Men's 100m Heats - James Dasaolu 3rd Heat 7 10.18/-0.4 q.
Sunday, 14th August: Men's 100m Semis - James Dasaolu 6th Semi-Final 3 of 3 10.16/0.0. Monday, 15th August: Women's Discus Qualifying - Jade Lally 15th in Pool B 54.06m. Thursday, 18th August: Women's High Jump Qualifying - Morgan Lake 5th Pool A 1.94m Q equals Surrey U20 record. Men's 4x100m Heats - Harry Aikines-Aryeetey (Leg 2) 4th Heat 2 38.06 q.
Friday, 19th August: Men's 4x100m Final - Harry Aikines-Aryeetey (Leg 2) 4th 37.98. Men's 4x400m Heats - GB disqualified for infringement on 2nd takeover after finishing 1st in second heat. Saturday, 20th August: Women's High Jump Final - Morgan Lake =10th 1.93m. Performances by Surrey Athletes at all Olympic Games. SURREY UNDER-13 BOY'S 1500M BEST PERFORMANCE - Jaden Kennedy (Herne Hill H) recorded a time of 4:21.61 at the Hercules Wimbledon Sprint & Middle Distance Open Meeting held at Wimbledon Park on 3rd August 2016. This is the fastest known time by a Surrey Under-13 Boy for this distance. He now has the best times for both 800m & 1500m. Surrey All-time Best Performers for Under-13 Boys 1500m. CAU INTER-COUNTY TRACK & FIELD CHAMPIONSHIP, BEDFORD, 30TH/31ST JULY 2016 - Performances by Surrey athletes. DEREK CROOKES UNDER-13 INTER-COUNTY TRACK & FIELD, KINGSMEADOW, 31ST JULY 2016 - Performances by Surrey athletes. Congratulations to both of the Surrey Boys & Girls teams who won.The full results are available on the EVENT WEBSITE. Members of the Surrey Girls Team. In the Boys 800m the winning time of 2:09.00 by Jaden Kennedy (Herne Hill) is the fastest known time by a Surrey Under-13 Boy. Surrey All-time Best Performers for Under-13 Boys 800m. SURREY ROAD LEAGUE 2016 - Results & League Tables after the first 6 races (NOTE. Revised 1st August). SURREY UNDER-17 WOMEN'S JAVELIN RECORD - Competing at the Schools International Meeting held at Ashford on 16th July 2016 Paula Holguin (Cambridge H) set a new record of 47.01m when finishing third in the Intermediate Girls 500g Javelin. She set the previous record of 46.95m in June at the Surrey Schools Championships. Surrey Under-17 Women Records. BILL PAYNE - Bill died on 22nd July 2016 in a nursing home in St Catherines, Ontario, Canada. He is survived by his wife Maureen. Bill was a member of Sutton & Cheam Harriers where he was a coach from the 1950s through to the 1970s when he moved to Canada and coached there at Brock University. Bill's son Steve is compiling a memorial on Facebook. A Canadian obituary. We thank Alex Fruin for this information. SURREY SENIOR WOMEN'S 3000M STEEPLECHASE RECORD- Rosie Clarke (Epsom & Ewell Harriers) set a new record of 9:51.97 whilst competing in the Anniversary Games held in the Olympic Stadium, London on 23rd July 2016. This was her third Surrey record for the event this year. Her previous record of 9:52.20 was set in June. Surrey Senior Women Records. UNDER-17 INTER-COUNTY TRACK & FIELD, NORMAN PARK, BROMLEY, 17TH JULY 2016 - Surrey Performances & Team scores. Full Male results. Full Female results. In the 1500m Steeplechase Katie Balme (Herne Hill Harriers) set a new Surrey U17 record of 5:13.72. The previous record of 5:14.41 was set by Kathryn Ditton (WSEH) in 2014. Surrey Under-17 Women Records. ENGLISH SCHOOLS TRACK & FIELD CHAMPIONSHIPS, GATESHEAD, 8TH/9TH JULY 2016 - SURREY MEDAL WINNERS (updated 26.07). IAAF WORLD JUNIOR (UNDER-20) CHAMPIONSHIPS, BYDGOSZCZ, POLAND, 19TH - 24TH JULY 2016 - UKA have announced the "first wave" of selections for the GB & NI team. They include Rechmial Miller (100M - Hercules Wimbledon AC) and Imani Lansiquot (100M - Sutton & District AC). In the "second & final wave" of selections announced on 5th July Zanson Plummer (4x100m Shaftesbury Barnet) was added to the team. Rechmial Miller and Imani Lansiquot were also included in the 4x100m relay squads. 19.07 JM 100M Rechmial Miller Heat 5 2nd 10.44/+0.6 Q. 20.07 JW 100M Imani Lansiquot Heat 3 1st 11.17/+1.7 Q SURREY U20 RECORD (previous record of 11.25 set by Imani in June). Surrey Under-20 Women Records. 20.07 JM 100M Rechmial Miller Semi-Final 3 3rd 10.37/+0.7 q; FINAL 8th 16.18/+0.2. 21.07 JW 100M Imani Lansiquot Semi-Final 1 1st 11.24/+0.7 Q; FINAL 4th 11.37/+0.9. 22.07 JM 4x100M Zanson Plummer Heat 1 (Leg 1) 1st 39.91 Q. NOTE. The GB U20W 4x100M which did not include Imani did not finish in Heat 2. 23.07 JM 4x100M Zanson Plummer FINAL (Leg 1) 6th 39.57. Joseph Massimo (200M - Crawley AC) & Sam Talbot (Decathlon - Exeter H). 16.07 Boys Decathlon Sam Talbot - 100M Heat 3 2nd 11.00/+1.5 (861pts); LJ Group A 1st 7.05m/+0.8 (826pts); SP Group B 7th 12.80m (655pts); HJ Group B 1st 1.93m (740pts); 400M Heat 3 3rd 50.30 (801pts). 17.07 Boys Decathlon Sam Talbot - 110MH Heat 3 1st 13.86/+1.9 (993pts); DT Group A NM (0pts); PV Group A 4th 4.00m (617pts); JT Group A 10th 49.68m (584pts); 1500m 8th 4:46.45 (640pts). Total score of 6717 points in 12th place. MARTIN ROONEY RETAINS 400M TITLE. GOLD MEDAL FOR JAMES DASAOLU IN 4X100M RELAY. Martyn Rooney (400M defending champion - Croydon H); James Dasaolu (4x100m - Croydon H); Harry Aikines-Aryeetey (4x100m defending champion - Sutton & District AC); Johnny Hay (Half-Marathon Cup - Aldershot, Farnham & District); Adelle Tracey (800M - Guildford & Godalming AC); Rosie Clarke (3000m Steeplechase - Epsom & Ewell H); Jade Lally (Discus - Shaftesbury Barnet H); Morgan Lake (Heptathlon - Windsor, Slough, Eton & Hounslow AC) and Lily Partridge (Half-Marathon Cup - Aldershot, Farnham & District AC). Congratulations to Jade Lally who has been selected to carry the Union flag at the Opening Ceremony. DAY 1 (Wednesday, 6th): Jade Lally threw 58.76m in the first round of Discus Pool B to qualify for the final on Friday. Martyn Rooney won Heat 3 of the 400m wiith a time of 46.57 to qualify for the semi-finals on Thursday. Adelle Tracey finished 6th in Heat 4 of the 800m with a time of 2:05.41 and did not qualify for the semi-finals. DAY 2 (Thursday 7th): Martyn Rooney ran 45.04 to win the second of three semi-finals of 400m to qualify for Friday's final. DAY 3 (Friday 8th): Morgan Lake finished 7th in the first heat of the Heptathlon 100m Hurdles with a time of 14.72/-0.9 (879pts). She jumped 1.89m (1093pts) in the High Jump the only competitor to jump higher than 1.80m to be placed equal third after 2 events. In the Heptathlon Shot Putt Morgan achieved a season's best of 13.24m (743pts) and lies 10th with 2715pts. Morgan did not start in the 200m and, therefore, has withdrawn from the event. Rosie Clarke finished in 12th place in the second heat of the 3000m Steeplechase with a time of 10:00.25. Martyn Rooney won the final of the 400m in 45.29. Jade Lally threw 60.29m to finish 7th in the Discus Final. DAY 4 (Saturday 9th): Men's 4x100m Heats - GB & NI won Heat 1 in 38.12 with James Dasaolu running the first leg..
DAY 5 (Sunday 10th): Lily Partridge finished in 53rd place in the Women's Half-Marathon Cup with a time of 1:16:57. Johnny Hay finished 77th in the Men's Half-Marathon Cup with a time of 1:10:08. James Dasaolu ran the first leg for the GB&NI team in the Men's 4x100m Final which they won in 38.17. Performances by Surrey Athletes at 2016 European Championships. Performances by Surrey Athletes at all European Championships (1938 - 2016). SENIOR INTER-COUNTY TRACK & FIELD CHAMPIONSHIP, BASINGSTOKE, 10TH JULY 2016- RESULTS (link corrected 25/07). SURREY UNDER-13 BOY'S 800M BEST PERFORMANCE - Jaden Kennedy (Herne Hill H) recorded a time of 2:09.5 when winning the Under-13 Boy's 800m at the YDL meeting held at Hornchurch on 19th June 2016. This is the fastest known time by a Surrey athlete for this distance. Surrey All-time Best Performers for Under-13 Boys 800m. SURREY ROAD LEAGUE 2016 - Results & League Tables after the first 4 races. SURREY COUNTY 10K ROAD CHAMPIONSHIPS, RICHMOND, 19TH JUNE 2016 - RESULTS. UK CHAMPIONSHIPS & OLYMPIC TRIALS, BIRMINGHAM, 24TH - 26TH JUNE 2016 - Victories for James Dasaolu (SM 100M) & Morgan Lake (SW HJ) on the second day plus Jade Lally (SW ST) & Rosie Clarke (SW 3000SC) on the third day. SURREY MEDAL WINNERS. In the Senior Women's 3000m Steeplechase held on the 26th June Rosie Clarke (Epsom & Ewell Harriers) set a new Surrey County record of 9:52.20 when winning the final. This improved the previous record of 9:54.82 which she set in May. Surrey Senior Women Records. EA UNDER-23 & UNDER-20 CHAMPIONSHIPS, BEDFORD, 18TH/19TH JUNE 2016 - Victories for Rechmial Miller (U20M 100M); Imani Lansiquot (U20W 100M) and Gus Cockle (U20M 3000M) on the first day plus Morgan Lake (U20W HJ); Jack Phipps (U23M PV); Oliver Newport (U23M LJ) and Joey Watson (U23M SP) on the second day. SURREY MEDAL WINNERS. In the Under-20 Women's 100m held on the 18th June Imani Lansiquot (Sutton & District AC) set a new Surrey County record of 11.25/+1.6 when finishing 1st in Heat 3. This improved the previous record of 11.28 which she set earlier this month. Surrey Under-20 Women Records. In the Under-20 Men's 110m Hurdles held on the 19th June Robert Sakala (Croydon H) set a new Surrey County record of 13.66/+1.9 when finishing 3rd in the final. This improved the previous record of 13.76 which he set in May 2016. Surrey Under-20 Men Records. SURREY SENIOR WOMEN'S HAMMER RECORD - Competing at the SAL fixture held at Kingsmeadow on 18th June 2016 Pippa Wingate improved her existing record from 58.69m, set in August 2015, to 59.14m. Surrey Senior Women Records. 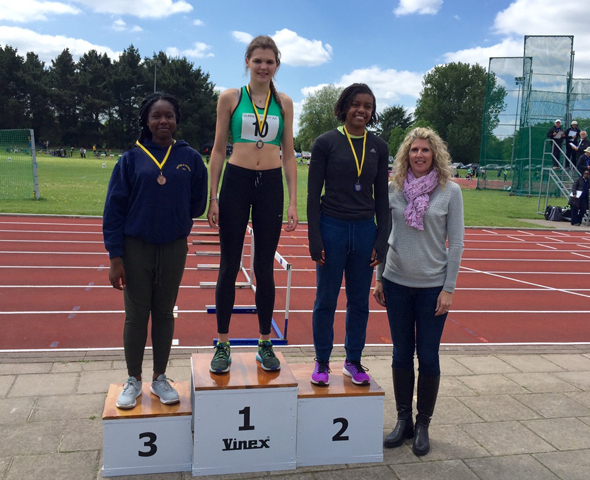 SURREY UNDER-17 WOMEN'S JAVELIN RECORD - Competing at the Surrey Schools Championships held at Kingsmeadow on 11th June 2016 Paula Holguin set a new record of 46.95m when winning the Intermediate Girls 500g Javelin. The previous record of 40.79m was set by Cathy Coleman on 16th August 2014. Surrey Under-17 Women Records. SURREY ROAD LEAGUE 2016 - Results & League Tables after the first 3 races. SURREY COUNTY 10 MILE CHAMPIONSHIPS, DORKING, 5TH JUNE 2016 - RESULTS. SURREY SENIOR MEN'S 300M RECORD- Martyn Rooney (Croydon H) set a new record of 32.71 when he finished second in the the 300 metres held in the Gouden Spike meeting in Leiden, Netherlands on 11th June 2016. The previous record of 32.89 was set by David McKenzie on 12th July 1996. Martyn now holds the County Senior records for 300m, 400m & 600m. Surrey Senior Men Records. 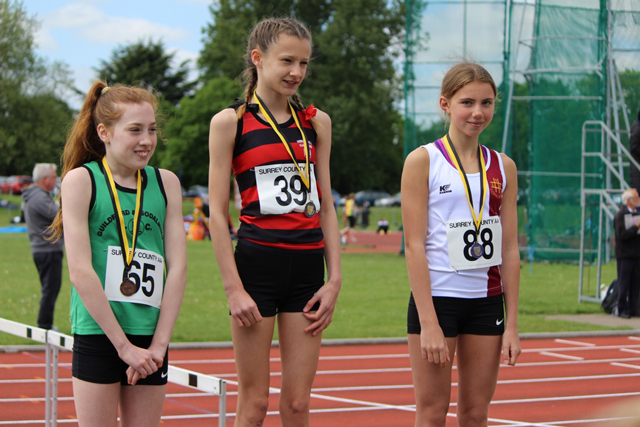 SURREY UNDER-13 GIRL'S 1500M BEST PERFORMANCE - Maisie Collis (Herne Hill H) recorded a time of 4:48.1 when winning the Under-13 Girl's 1500m at the Lily B meeting held at Croydon on 4th June 2016. This is the fastest known time by a Surrey athlete for this distance. Surrey All-time Best Performers for Under-13 Girls 1500m. SURREY COUNTY MASTERS TRACK & FIELD CHAMPIONSHIPS, EWELL COURT, SUNDAY 5TH JUNE 2016 - RESULTS (updated 12.06.16). Updated list of Championship Best Performances. SURREY UNDER-20 MEN'S 110M HURDLES RECORD- Robert Sakala (Croydon H) set a new record of 13.76/+1.0 whilst competing in the Active Newham Open Series meeting held in Newham on 25th May 2016. The previous record was 13.81/+0.4 which was set by Rushane Thomas on 3rd August 2014. Surrey Under-20 Men Records. SURREY UNDER-17 MEN'S 200M RECORD- Joseph Massimo (Crawley AC) set a new record of 21.36/+1.6 whilst competing in the British League Division 2 fixture held in Cardiff on 7th May 2016. The previous record was 21.65/+1.0 which was set by Uvie Ugono on 7th August 1994. Surrey Under-17 Men Records. OUTDOOR TRACK & FIELD RANKINGS 2016 - Following the County Campionships we have caught-up with the rankings. We are still seeking volunteers to look after the female age group (U20/U17/U15/U13) listings. Anyone considering undertaking these tasks should contact Keith Burchell. EA SENIOR / UNDER-20 COMBINED EVENTS CHAMPIONSHIPS, BEDFORD, 14TH/15TH MAY 2016 - Congratulations to Dylan Carlsson-Smith (Shaftesbury Barnet Harriers) for his victory in the Under-20 Decathlon and to Sam Talbot (Exeter) for his victory in the Under-18 Decathlon. Surrey medal winners. SURREY ROAD LEAGUE 2016 - Results & League Tables after the first 2 races. SURREY COUNTY TRACK & FIELD CHAMPIONSHIPS, KINGSMEADOW, SATURDAY/SUNDAY 14TH/15TH MAY 2016 - Results (Contains all events from both days). All performances have been added to the Results database and existing profiles have been updated. The information from the field cards has also been added to the Results database - these can be viewed by accessing the results by clicking on Results : Track & Field : County Championships : 2016 and select the required Age Group. Winner of the U20 Women's 200m at this year's Surrey Championship was Jemma Wood of Guildford & Godalming and making the medal presentation for that event was her mother Louise (nee Manning) - far right - who in 1983 won the U17 High Jump with a Championship Best Performance of 1.76m, a record that still stands today after 33 years. "How time flies," admitted a proud mother. SURREY COUNTY HALF-MARATHON CHAMPIONSHIPS, RICHMOND, 1ST MAY 2016 - RESULTS. SURREY SENIOR WOMEN'S 3000M STEEPLECHASE RECORD- Rosie Clarke (Epsom & Ewell Harriers) set a new record of 9:54.82 whilst competing in the Payton Jordan Invitational held in Palo Alto, Califonia on 1st May 2016. In the same race Molly Renfer (Kingston AC & Polytechnic Harriers) ran 10:10.51 which also beat the previous record. The previous record was 10:11.33 which was set by Molly Renfer at the same venue on 1st April. Surrey Senior Women Records. MEN. 1st Mick Harran (Surrey WC) 65:48.7; 2nd Peter Hannell (Surrey WC) 65:58.8; 3rd Chris Flint (Surrey WC) 67:21.3. WOMEN. 1st Fiona Bishop (Woking AC) 69:54.3. JUST ARRIVED - UKA RULE BOOK £5.50 plus £1.80 p&p - ORDERS CAN BE PLACED VIA THE SURREY SHOP. SURREY UNDER-20 HAMMER RECORD - Gareth Cook has informed us that he threw the 6kg Hammer 63.80m whilst representing England Schools in the ISF World Gymnasiade held in Nice on 4/6 June 1986. This performance is now recognised as the Surrey Record. Therefore Peter Cassidy (Guildford & Godalming AC) and Munroe Ritchie (Crawley AC) have until the end of this season to try and better Gareth's throw. The confusion arose because, in 1986, in the UK Under-20 Men were throwing a 6.25kg Hammer and Gareth's throw being achieved under International Rules which prescribed a 6kg Hammer meant that his throw was not included in the UK rankings. Surrey Under-20 Men Records. DAVID DYER - David passed away suddenly, but peacefully, aged 83 on 10th April 2016. He had been an active Field Judge and Timekeeper for many years. His funeral will take place at the Kingston Crematorium, at 1:30pm on Monday, 25th April 2016. U13/U15 SPORTSHALL - NATIONAL FINALS, SPORT CITY, MANCHESTER, 16TH/17TH APRIL 2016 - Following the conclusion of all the Regional rounds it has been announced that the Surrey Under-13 Girls team plus Marcus Austin in the Under-13 Boys Long Jump have qualified for the national finals. Their events will be held on Saturday, 16th April. Great Day - Under-13 Girls team did Surrey proud - finished 2nd out of 11- Norfolk turned the tables on us - last year they went as best runners-up and came 2nd to us & this year was the reverse. 8 individual medals for the Surrey girls. Also GOLD for Marcus Austin (DMV) in his individual standing long jump of 2.63m. SURREY COUNTY DISABILITY CHAMPIONSHIPS, KINGSMEADOW, SATURDAY/SUNDAY 9TH/10TH APRIL 2016 - RESULTS. UNDER-15 GIRLS 300 METRES - It has been agreed to add the U15G 300m to the programme for the 2016 Surrey Track & Field Championships. The event has also been included within the All-time rankings and the inaugral County Record has been determined to be 40.8 which was achieved by Shona Richards in 2010 and Maya Bruney in 2011. Surrey Under-15 Girls Records. SURREY COUNTY ATHLETIC ASSOCIATION CONSTITUTION - The revised version of the Constitution as agreed at the AGM held on 11th March 2016 is available. SCAA Constitution. 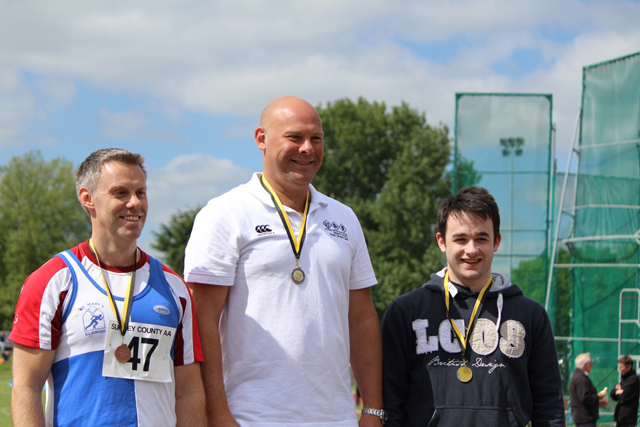 Pentathlon Morgan Lake (Windsor, Slough, Eton & Hounslow AC). Performances by Surrey athletes in previous World Indoor Championships. U13/U15 SPORTSHALL - SOUTH-EAST REGION FINALS, BURGESS HILL, 6TH MARCH 2016 - RESULTS & TEAM PHOTO. CAU INTER-COUNTY CROSS-COUNTRY CHAMPIONSHIPS, COFTON PARK, BIRMINGHAM, SATURDAY, 12TH MARCH 2016 - Another fantastic day for Surrey at Cofton Park. 6 Surrey teams finished in the top five. We thank all the athletes for their hard work and commitment over the year. We say a special thank you to the coaches, parents and friends for their support of the athletes week-in and week-out. We also thank Patricia & Michael Cole for stepping-in at the last minute to act as team managers, put up the County tent and hand out the team vests. RESULTS. 5 PAGES OF PHOTOS. SURREY COUNTY ATHLETIC ASSOCIATION ANNUAL AWARDS PRESENTATION & ANNUAL GENERAL MEETING, FRIDAY, 11TH MARCH 2016 - Pete Mulholland BEM was elected as President. All the other officers were re-elected. LIST OF AWARD WINNERS. LIST OF OFFICERS ETC. Coinciding with the start of the new track and field season, the latest version of the UKA Rules for Competition 2016 are to be launched on April 1st and UKA have announced information on the updates that will be included. These include important changes regarding compulsory athlete registration in competitions held under UKA Rules. It is important that athletes, club membership secretaries, team managers and others are aware of this and the associated guidance. While athlete registration has been a part of the rules of the sport for a number of years these changes mean it is essential that athletes are registered and aware of their registration details. We recommend you make yourself familiar with the information that is relevant to you and, where appropriate, draw the attention of others to the information that is relevant to them. You can read UKA's announcement at www.britishathletics.org.uk/media/news/2016-news-page/february-2016/08-02-16-rule-book-update. SURREY DISCUS RECORD FOR JADE LALLY - Competing in Sydney, Australia on 27th February 2016 Jade Lally (Shaftesbury Barnet Harriers) set a new Surrey record for the Senior Women's Discus. Her throw of 65.10m improved the previous record of 64.22m which she set 2 days earlier (see below). This will also be an English record. Surrey Senior Women Records. UK INDOOR TRACK & FIELD CHAMPIONSHIPS & WORLD TRIALS, EIS, SHEFFIELD, 27TH/28TH FEBRUARY 2016 - Congratulations to Morgan Lake (High Jump) and James Dasaolu (60 metres) for their victories on Saturday plus Adelle Tracey (800 metres) for her victory on Sunday. Surrey medal winners. SURREY DISCUS RECORD FOR JADE LALLY - Competing in Auckland, New Zealand on 25th February 2016 Jade Lally (Shaftesbury Barnet Harriers) set a new Surrey record for the Senior Women's Discus. Her throw of 64.22m improved the previous record of 61.22m which was set by Shelley Newman (Belgrave Harriers) in 2003. Surrey Senior Women Records. NOTE. David Cocksedge informs us that Jade's performance is also an English National record. SURREY COUNTY INDOOR TRACK & FIELD CHAMPIONSHIPS, DWLC, CARSHALTON, SATURDAY/SUNDAY 20TH/21ST FEBRUARY 2016 - RESULTS (Both days complete - revised 18:50 on 26.02.2016). All performances have been added to the database and profiles have been updated. Athletes without a profile should contact Webmaster and provide their date of birth. Information regarding field event series has been added. JOHN MORRIS 1932 - 2016 - It is with regret that we have to inform you of the death of John "Johnny" Morris, who died in St Georges Hospital, Tooting, at 83 years of age. John joined Belgrave Harriers in November 1958 and was a long distance walker. In 1971 he became a centurion, walking 100 miles in under 24 hours. After retiring from competitive athletics he became a graded track and field official and for many years officiated at the county championships and local club meetings. MALCOLM BURTON 1943 - 2016 - Malcolm died peacefully at St Helier Hospital in February. He had been ill for a few months. As a member of Mitcham AC during the late-1950s and the 1960s he won the Surrey Junior Men's Mile title in 1960. He maintained an interest in athletics during his later years through spectating at Crystal Palace and in 2012 by going with his granddaughters to the London Olympics. Profile. EA U20/U17/U15 INDOOR TRACK & FIELD CHAMPIONSHIPS, EIS, SHEFFIELD, 13TH/14TH FEBRUARY 2016 - Congratulations to the following Surrey athletes who won their events: Tyrese Johnson-Fisher (U17M 60m), Kyle Reynolds-Warmington (U15B 60m), Imani Lansiquot (U20W 60m), Marcia Sey (U15G 60m Hurdles) and Ore Adamson (U15G Long Jump). Surrey medal winners. SURREY MILE RECORD FOR OLI AITCHISON - Competing in the Husky Classic meeting in Seattle, USA Oli Aitchison (Aldershot, Farnham & District AC) set a new Surrey record for 1 Mile indoors on 13th February 2016. His time of 3:58.59 improved the previous record of 3:59.54 which was set by John Gladwin (Belgrave Harriers) in 1987. Surrey Senior Men Indoor Records. PHOTO-FINISH - As advertised on this page for many months now, Mike Scott is this year reducing his involvement with the SCAA photo-finish service. Unsurprisingly (given the huge amount of work that Mike has put into this activity each year) no one individual has come forward to take over the role. However, a team of SCAA officials, including several with extensive PF experience as Technical Officials, will be taking on the PF service for 2016. Mike will continue to play an important part, but as member of a wider team which will between them cover all aspects of the service. The initial priority is to resource Surrey County AA events, but it is intended that, as the expertise of the team progresses, we will start to take on events promoted by Surrey affiliated clubs and other competition providers. A decision regarding the extent of this is expected to be taken in mid-April. Until that time, it will generally not be possible to take any bookings, but expressions of interest can be sent to SCAA via Margaret Nelson (pf@surreyathletics.org.uk). Margaret will save the dates concerned (if not already reserved) until such time as a decision is made on whether the event can be resourced. 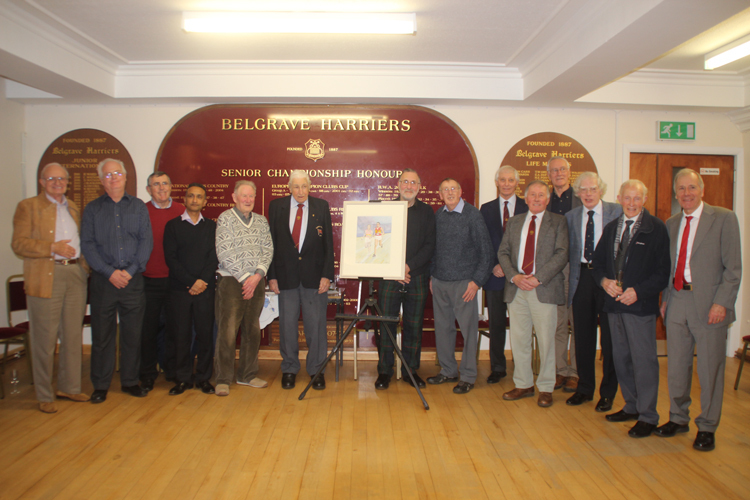 CONGRATULATIONS TO BILL LUCAS DFC - Former Surrey president and team manager Bill Lucas, DFC, was guest of honour at a celebration tea at Belgrave Hall on Sunday to mark 80 years' membership of Belgrave Harriers. Bill, who is in his 100th year, represented Britain in the 5000m at the Wembley Olympics in 1948 after just one year's training after serving in the RAF's Bomber Command for seven years and flying 81 missions, surviving unharmed. When he retired from active athletics, Bill was a valuable asset for the county as team manager during one of the most successful periods for Surrey in the UK Inter-Counties cross country championships. Many older members of Belgrave Harriers and representatives of the South of England AA and Surrey County AA were at the celebration tea which was attended by about 50 people. Bill thanked those present with an amazingly lucid and fascinating address which included explaining how he came to join Belgrave in 1936. In one of the two pictures taken by Mike Fleet, Belgrave chairman John Powell is presenting Bill with a commemoration vase and, in the other, Bill is surrounded by many of the athletes he managed during his period as Belgrave's cross country team manager. In the centre is a painting of him running in June 1952 at a meeting to mark the opening of the Wimbledon Park track. Profile. From left to right: George Flanagan, John Stow, Leo Coy, Tony Binda, Bob Taylor, Bill Lucas, Lionell Mann, Tony Fairclough, Alan Black, Bill Laws, Ken Miller, Charlie Dabbs, Pat Newall & Charlie Dickenson. SURREY 800M RECORD FOR ADELLE TRACEY - Adelle Tracey (Guildford & Godalming AC) set a new Surrey record for 800m indoors when she won in Vienna on 30th January 2016. Her time of 2:02.15 improved the previous record of 2:04.35 which was set by Katie Snowden (Herne Hill Harriers) in 2014. Surrey Senior Women Indoor Records. SURREY COUNTY ROAD RUNNING CHAMPIONSHIPS 2016 - Preliminary information. SURREY U13/U15 SPORTSHALL, SPECTRUM, GUILDFORD, 24TH JANUARY 2016 - RESULTS (updated 02.02.2016). SURREY COUNTY CROSS-COUNTRY CHAMPIONSHIPS, DENBIES, DORKING, SUNDAY 10TH JANUARY 2016 - RESULTS & PHOTOS. Performances have been added to the results database and existing profiles updated.